Looking for an easy way to add a second monitor? Let's get to multitasking! The JUA210 USB 2.0 Display Adapter from j5 create works as an external video card, instantly allowing users to attach additional displays via a VGA connection without the hassle of a lengthy setup or having to install additional internal hardware. The j5 create USB 2.0 Display Adapter can support up to four displays running on the same Windows computer (or up to two displays for Mac), turning your workstation into a fully functioning multi-display powerhouse. 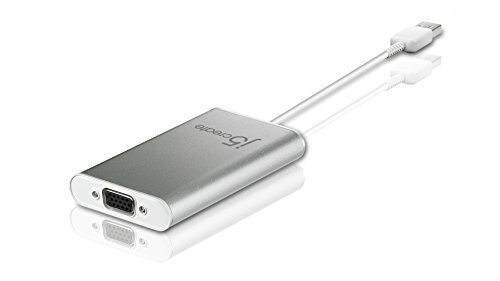 This video over USB adapter works as an external video card, instantly allowing additional displays, without the hassle of opening the computer casing and installing an external graphic card. You can have your 2nd monitor with an extended display, a mirrored display, a rotational display (rotation mode not available for MAC), or make it your primary monitor. The video playback will perform in 720P HD with a resolution up to 1920X1200, providing a low latency connection. Simple "Plug and Play" operation allows you to connect your computer to a second monitor or projector and within seconds to create a new visual environment. If you have any questions about this product by j5create, contact us by completing and submitting the form below. If you are looking for a specif part number, please include it with your message.